Au delà de l’OpenData français, les institutions internationales jouent un rôle important dans la définition des normes qui régissent l’accès et la réutilisation des données publiques. Alors que le Parlement Européen discute de la révision de la directive PSI sur les informations du secteur public, nous souhaitions saisir l’occasion pour encourager les citoyens européens à demander avec nous une définition claire des formats ouverts. Vous trouverez reproduit ci-dessous notre article en anglais tel que nous l’avons proposé à l’Open Knowledge Foundation. Following some remarks from Richard Swetenham from the European Commission, we made a few changes relative to the trialogue process and the coming steps: the trialogue will start its meetings on 17th December and it is therefore already very useful to call on our governments to support Open Formats! When we work on building all these amazing democratic transparency collaborative tools all over the world, all of us, OpenData users and producers, struggle with these incredibly frustrating closed or unexploitable formats under which public data is unfortunately so often released: XLS, PDF, DOC, JPG, completely misformatted tables, and so on. The EU PSI directive revision is a chance to push for a clear Open Formats definition! As part of Neelie Kroes’s Digital Agenda, the European Commission recently proposed a revision of the Public Sector Information (PSI) Directive in order to grant european public OpenData a new paradigm enabling mandatory re-use and an enlarged scope of public data to be liberated. As this revision gets discussed within the European Parliament (EP), this is the citizen’s chance to advocate for a clear definition of the Open Formats under which PSI should be released. being the result of an openly developped process in which all users can actually be part of the specifications evolution. Those are the principles we tried to advocate for in a policy note on Open Formats we published last week and sent individually to all MEPs from the committee voting on the revision of the PSI directive last thursday. Good news: the first rule was adopted! But the second one was not. How did that work? ITRE vote on Nov 29th: what happened and how? The European parliamentary process first involves a main committee in charge of preparing the debates before the plenary session, in our case the Industry, Research and Energy committee (ITRE). Its members met on november 29th around 10am to vote their report on the PSI revision among other files. 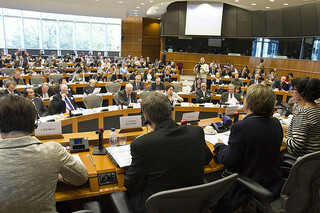 Members of the European Parliament (MEPs) can propose amendments to the revision beforehand, but, to fasten the process, the EP works with what is called « compromise amendments » (CAs): the committee chooses a rapporteur leading the file in its name and each political group gets a « shadow rapporteur » to work together with the main rapporteur. They all study together the proposed amendments and try to sum them up in a few consensual ones called CAs, hence leading MEPs to pull away some amendments when they consider their concerns met. During the committee meeting, both kind of amendments are therefore voted on along a predefined voting-list indicating the rapporteur’s recommandations. This amendment was adopted, meaning this change will be proposed as a new amendment to all MEPs during the plenary debate. Having the support of the rapporteur in the name of the responsible committee, it should therefore get strong chances to get carried along. Even though it also got recommanded for approval by the main rapporteur, unfortunately the ALDE and EPP groups were not ready to support it yet and it got rejected. What next? Can we do anything? Now that the ITRE committee voted, its report should soon be made available online. As the European institutions work as a tripartite organisation, the text adopted by the ITRE committee will now be transferred to both the European Commission and Council for approval. This includes a trialogue procedure in which a consensus towards a common text must be driven. This is an occasion to call on our respective national governments to push in favor of Open Formats in order toc maintain and improve the definition which the EP already adopted. The text resulting of the tripartite debate will be discussed in plenary session, planned so far for March 11th 2013. Until noon on the wednesday preceding the debate, MEPs will still have the possibility to propose new amendments to be voted in plenary: they can do so either as a whole political group, or as a group of at least 40 different MEPs from any groups. When the deadline for proposing amendments will be reached, we should call on our MEPs by email, phonecalls or tweets to vote for such amendment and possibly against some opposed ones. In order to allow anyone to easily and freely phone their MEPs, we’re thinking about reusing La Quadrature du Net‘s excellent PiPhone tool for EU citizens advocacy. In any way, contacting MEPs to raise concerns on Open Formats policies can of course always be useful at all times before and after the plenary debates. Policy papers, amendments proposals, vulgarisation documents, blogposts, open-letters, a petititon, tweets, … Anything can help! To conclude, we would like to stress out once again that Regards Citoyens is an all-volunteers organisation without much experience regarding the European institutions: this beginning advocacy work was all of a last-minute discovery and reaction pulled by a few on the side of our respective jobs. This means anyone’s help is both possible and necessary! Let’s get all ready to defend Open Formats for European OpenData in a few weeks!